Disclaimer: I love the Buku Music + Art Project. I don’t say that as a brand ambassador, or a paid shill (enthusiasm doesn’t pay much), but as a fan of weird music that likes meeting other people that like weird music. 2019 will be my sixth BUKU, and I keep coming back because of how delightfully weird it is. 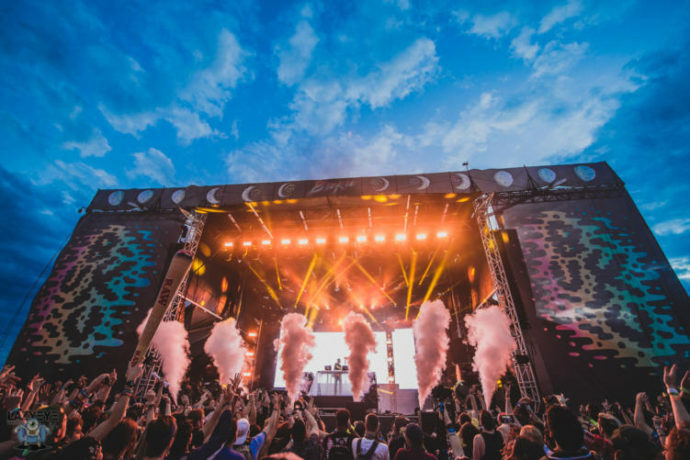 Although the corporate festival bubble has long since burst, BUKU has proudly worn it’s whacky DNA on its sleeve year after year, matching its well-known headliners with scores of innovative, genre-shredding artists for fans that can’t see them anywhere else. The eclectic undercard of the 2019 lineup reflects the motley, anything-goes nature of New Orleans. For that reason, I thought I would navigate through the names that lit my eyes up when the artists were announced, and dug into the ones I had never heard before to make this handy compendium for what sounds you should explore come March 22 and 23. While not exactly a sleeper hit, Oliver Tree is perhaps the most enigmatic, oddball personality imaginable with 27 million hits on Spotify, enough to fly over and under many people’s radar. His severe bowl cut, scooter tricks, and exaggerated 80’s fashion sense all point to an artist in his own lane, but so does his infectious pop hooks and unmistakable vocal style. He’s appeared with acts as far-flung as Louis the Child and Getter, and his meme-laden persona can’t disprove that he’s going to fiercely grab audience attentions whether you believe the alien boy is serious or not. In a bizarre, appreciated choice of booking, Thou’s seething brand of misanthropic doom metal has a slot on one of the largest electronic music festivals in the country. The Baton Rouge-based band achieved national coverage last summer for a trio of EP’s on three different labels, capped off with the critically-acclaimed LP Magus. If you’re seeking a different form of heavy music, look no further. Vocalist Bryan Funck’s anguished howl is going to be louder than anything else in Mardi Gras World playing at the same time. I cannot stress enough how strange, and potentially captivating, this show is going to be. Freshly signed to Warp Records, Yves Tumor‘s noise-laden solo art show is not for everyone. It breaks genres so freely and quickly that I encourage Death Grips fans to take special note. Sean Bowie switches fluidly from moody 90’s brit-pop, to post-industrial buzzsaw synths, to a nowhere zone of deconstructed house rhythms, and stitch the pieces back together faster than you’ll be able to figure out what’s going on. It’s going to be audacious, and I’m curious to see if Bowie shocks BUKU audiences in the best way possible. Dirtybird giants Claude VonStroke and Fisher are the de facto house artists that jumped out at fans from the moment the lineup dropped, but another absolute star in the genre is Chicago’s The Black Madonna. Blending a spirited, seamless mix of techno, old-school house, and disco chops in her live sets, DJ Marea Stamper exploded in both the Midwest and European club scenes. Now, her accolades include Mixmag’s “DJ of the Year 2016,” “Vice’s Artist of the Year,” and she serves as the creative director for Chicago’s legendary Smart Bar. Don’t sleep like I did. “Make it rain gurl, make. it. rain. make it rain gurl, make. it. rain.” While “raingurl” erupted globally off Yaeji’s acclaimed EP2 last year, I don’t know that audiences completely caught onto this curiously subdued artist who flits between house and hip-hop, even English and Korean, with such charming, reckless abandon. She contrasts heavy sub-bass with soft whispers, or a smooth beat with a sly, hazy rap. Her voice will softly boast about her club prowess in English, while she shyly questions herself in Korean. She’s a player bearing the heft of introspection, and it makes her club bangers a unique twist that’s engaging and so, so catchy. Duskus, the sole VIP artist we’re including on this list, is much more serene a listen than Jantsen, and much more underrated than Charlesthefirst, two other artists garnering the majority of the VIP attention. A young London-based producer signed to San Holo’s bitbird label, Duskus is steadily garnering attention for his ultra clean, shuffling tunes. They’re wonderfully produced and feature crystal clear synths and 8-bit samples galore. Featuring prominently in collabs with San Holo, including the hit “forever free,” we’re excited to see his talent surprise new audiences beyond bitbird super fans. We can talk about how quickly artists like Peekaboo and Mersiv became bass music sensations, but the instantaneous rise of the mysterious 1788-L was nothing short of meteoric. His debut show in Los Angeles last summer sold out almost immediately, and big names in attendance including The Glitch Mob, Hex Cougar, and Quix remarked the first show was insane. With notable remixes for Rezz, Virtual Self, and Daft Punk under his belt, 1788-L is taking Soundcloud by storm, faster than I think audiences have been able to keep up with. No press photos reveal his face, and his social media presence is…skeletal at best, but his glitchy, high-grade trap music speaks for itself. BUKU will be the next testing ground for the shadowy android. Selling out shows, and still underrated! Roy Blair falls cleanly into the recent L.A. indie scene with reverb-drenched guitars, bubblegum pop hooks, and enough teenage angst to cuff a few pairs of Levi jeans on first listen. And it works! Fans of the rap collective Brockhampton will love the 21 year-old’s sunny boy band delivery. Unsurprisingly, Roy is a friend of the supergroup, collaborating with leader Kevin Abstract, and appearing on the VICE show “American Boyband” numerous times. His sound is lively, saccharine, and cleanly produced enough to charm scores of people at BUKU looking for a pop fix. While not a producer in her own right, local DJ Tristan Dufrene deserves special mention in this guide for her thrilling old-school techno sets, a hard, exhilarating sound which previously eluded New Orleans for quite some time. Seeing the missed opportunity, she showcases her deep dance music catalog quite frequently at venues including Dragon’s Den, Joy Theater, and Santos bar. Playing all manner of deep house and hypnotic forms of techno, she’s not to be missed by those looking for a new style of electronic to sink their teeth into, or by longtime fans of the genre. The picture above is from a great show at BUKU 2016’s Back Alley stage. Delicate, rosy, and above all colorful, French producer Kidwaste will provide a necessary elegance to the BUKU menagerie. Somewhere between the glowing bedroom pop expanse of Kasbo and Jai Wolf, and the murmured honesty of indie folk artists lies Kidswaste’s sonic playground. Still relatively new to American audiences, and with the early support of Dancing Astronaut, VICE, and Billboard under his belt, this BUKU slot could be a major watershed moment for American audiences…and their dry eyes, honestly. There’s no shortage of stellar hip-hop on this year’s BUKU with J.I.D, Denzel Curry, and A$AP Rocky in tow. There is a shortage of hype for Atlanta’s most exciting hip-hop duo in some time. Johnny Venus and Doctur Dot pay tribute to Outkast in spades as EARTHGANG without ever sounding derivative, and their Southern-fried tumbling verses snake elegantly over some of underground hip-hop’s warmest production since Joey Bada$$ and Pro Era reinvigorated the sound a few years ago. Underrated, and not to be missed. Although he’s enjoyed a considerable amount of hype in the past year, still too few people know about the wiz kid from Louisiana that has been dazzling audiences again and again with his vibrant live mashup style, exhilarating sound design and onstage energy. Electric Forest saw Mersiv performing again and again both weekends. Currently turning heads night after night with Boogie T’s live band, we’re hoping for a packed, exuberant audience for the young producer’s rapidly expanding cult following. Again, the house music runs deep at BUKU for those willing to dig for it, and if you’re not familiar with Mason Maynard‘s prolific, pummeling house cuts, you’re in for a treat. The British 22 year-old has already received praise from genre mainstays like Eric Prydz and Seth Troxler as a wizard on the decks, and BBC’s Radio 1’s Monki dubbed him “One to Watch” and provided him with a special mix slot. Green Velvet, the Chicago tech house legend who rocked Buku’s Wharf Stage last year, saw enough potential in the young DJ to collaborate with him again and again on his Relief Records label. I don’t know anything about house and I can’t stop listening to this. Rounding out this guide is a “swamp-funk” band from Louisiana with enough Southern psychedelic flair to evoke Dr. John himself. Mixing in everyone from Lynyrd Skynyrd through today to King Gizzard in their smoky menagerie, the four-piece band leans on swirling, bluesy rhythms and fiery lead guitar in their songs. The voodoo spell is set by swift incantations from vocalist William Murry and anchored by a rock-steady rhythm section. Seeming to be everywhere since their self-titled debut album released last summer, the funky quartet may have their largest audience yet as one of the few rock bands performing this upcoming BUKU. Featured image via Lazy Eye Photography.